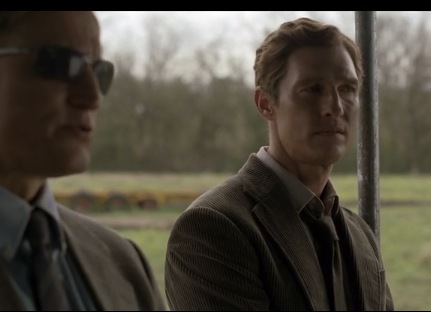 As it turns out, True Detective is the story of a seeker of truth. Rust Cohle’s moment of enlightenment in episode 8 came after years of searching and suffering. The most elegant and revealing statement of Cohle’s struggle and revelation is, in my opinion, the sermon delivered by Joel Theriot in episode 3, The Locked Room. The seemingly less than sophisticated preacher and an audience of those at the margins of life in rural Louisiana hide the profound message delivered for those willing to listen. Episode 3 shows only a portion of the sermon. The entire sequence is available on YouTube and is well worth watching (several times). The sermon represent a narrative map for the broader story told throughout the series, which reaches a climax at the end of the season finale. Of note, preacher Theriot is of the evangelical school of Christianity. He both delivers the sermon to and experiences it with the congregation as indicated by their frequent, fervent interaction. There are no strictures, admonitions, or rules; just the presentation of a higher wisdom and path to inner peace available to everyone with ears to hear. Theriot’s sermon is in italics along with my comments. He saw you in those dark corners. He heard you. Oh brothers, he heard those thoughts. The question, are you there? Since the death of his daughter, Cohle has suffered unrelenting guilt for failing to protect her. For years, Cohle has been the only person listening to his thoughts. No one else is there. He is alone without comfort. Would that we had ears to hear, because every moment, every now is an answer. Every beat of every heart, every second of every minute, every minute of every hour, every hour of every day is an answer. And the answer is yes, yes, yes. Your sorrows pin you to this place. They divide you from what your heart knows. … We bandaged our soft selves in hardness and anger. You are a stranger to yourself and yet he knows you. And, when your hard heart made you like unto the stone and broke you from his body – which is the stars and the wind between the stars – he knew you. He knew you yet and forever. Because I ask you, how could a father forget his children? Cohle became a stranger to himself as a result of hardness and anger due to the death of his daughter. He was so hardened to the world, so profoundly skeptical and alienated, it broke Cohle from his body; separated him from the embrace and protection of the peace surrounding him at the time of his greatest need. The shape of our face is not yet known to us. The story of Cohle’s life after the loss of his daughter is the story of sorrow and grief becoming such a burden that Cohle forgot himself and the world. Theriot challenges everyone there, including Cohle, to remember this truth. This world is a veil and we are not ourselves. The shape of our face … not yet known to us is the essence of the message. By using the term yet, Theriot indicates that the veil can be lifted, that we can know ourselves as Cohle realizes at the end of the final episode. Cohle’s insights shared with Marty mark both his enlightenment and his willingness to join the world through a real relationship with his partner. Cohle talks about descending into the darkness of death as losing my definitions. This prepares him to see the ability to join with his lost daughter as the final words of the sermon promise. This further elaborates Cohle’s enlightenment. This is our birthright but realizing it requires profound suffering and trials, in some cases. This was one of those cases. This entry was posted in Art, Books, Music & Film and tagged finale, Rust Cohle, True Detective. Bookmark the permalink. wow, interesting review of True Detective. btw, I was an extra on the episode pictured above… in the revival tent, and later on the hood of a car smoking, like a true backslider… lol.